Home » Comments » Countries » Popular Articles » Mumbai Memoirs – Mumbai’s ‘Men In White’! Ants at work! Photo courtesy: Google image. We all have seen a colony of ants at work. 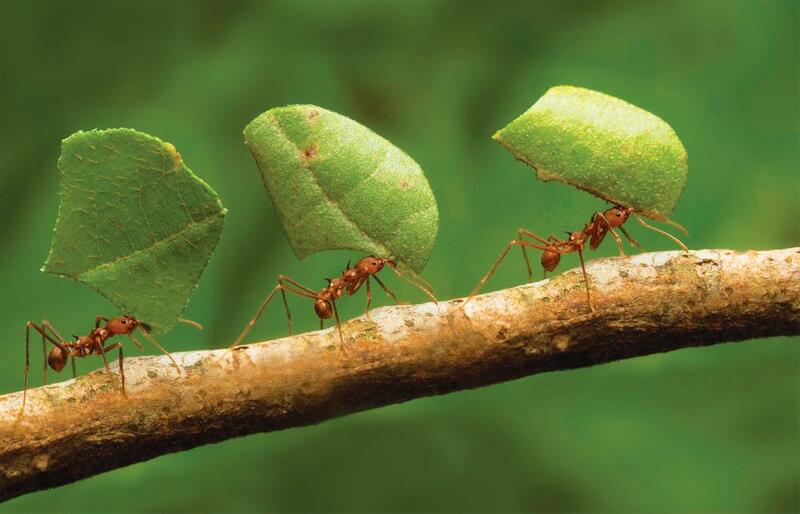 Once a food source is discovered, the ants get to work with amazing speed and discipline. A similar sight will be seen during Mumbai’s rush hours, where you will see a force of 5000 men at work! But the difference between the ants and these men is that they collect lunch tiffins from homes & catering services and deliver it to offices and schools, where people await the arrival of their respective mid-day meals. Their white cotton clothing and a Gandhi cap, has become iconic, not only for spotting them among the city’s maddening crowd, but also has been instrumental in creating Mumbai’s international identity, over the past 125 years! An inquisitive tourist may wonder about the uniqueness of these simple but immensely determined Mumbai’s ‘Men in White’! Well, they are none other than Mumbai’s ‘dabbawalas’, which literally means the ‘tiffin carrier men’ of Mumbai! On a typical weekday morning, a dabbawala will be seen collecting ‘dabbas’ (tiffin boxes) from numerous households that have registered with Nutan Tiffin Box Supplier Association, which formally came into being as a charitable trust in 1956. Every dabbawala aims to timely deliver the tiffin box, which contains fresh home-made food, at its respective destination till lunch time. Carrying loads of lunch boxes either on his bicycle, hand-cart or one’s shoulder, a dabbawala will head towards the nearest train station by 9am. At every suburban train station, the tiffin crates are loaded in the train’s luggage compartment. Thus begins the North to South journey of the tiffins. Besides other train stations, majority of the dabbawala work force is seen operating at major railway stations namely Chuchgate or Chatrapati Shivaji Terminus (earlier knows as Victoria Terminus). The tiffins are unloaded from the crates and are then sorted according to a simple but unique coding system designed by the dabbawala association. 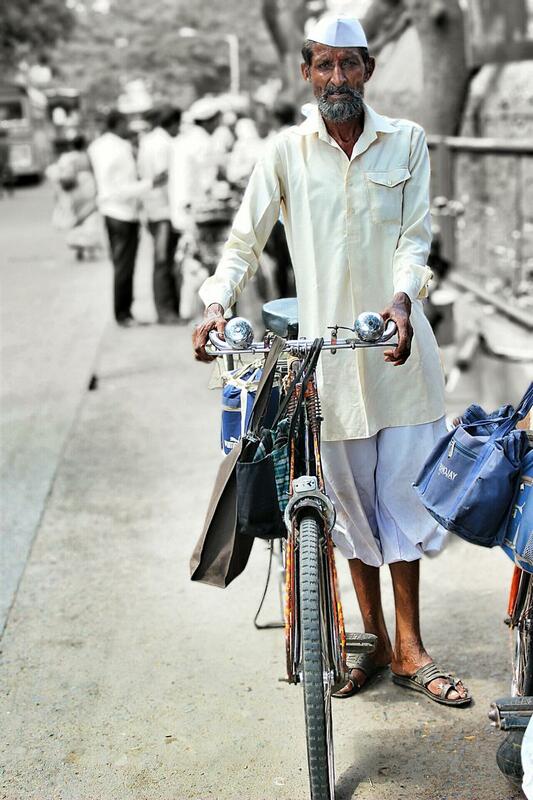 Dabbawala & his bicycle. Photo courtesy: Aditya Chichkar. 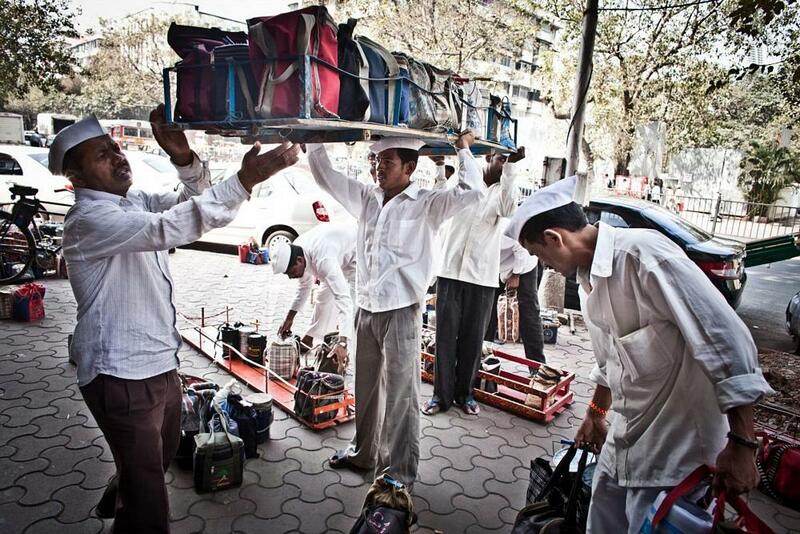 With amazing speed and accuracy the dabbawalas then deliver the tiffin to their respective owners by 12.30pm. While their patrons relish a home-made, lip-smacking Indian lunch, all the dabbawalas gather nearby and have their own meal before they get back to work. At around 2pm, the dabbawalas collect the empty tiffins from the offices or schools and bring them back to the train station. The tiffins are then loaded back into the crates and thus their South to North Mumbai return journey begins. The tiffins are then handed over to their respective homes, after which the dabbawalas unwind and retire for the day by 5pm. Come sunshine or rain, the same routine is followed by the dabbawalas from Monday to Saturday around the year. With values that blend work with spirituality their work efficiency highlights application of time Management, sense of Ownership, Team Work and also their belief that ‘service to mankind is service to God’. The Dabbawalas hail from the Warkari community of Maharashtra and are devotees of Vithoba, a reincarnation of the Hindu God, Lord Vishnu. True to the Warkari culture, they believe in the ‘Work is Worship’ philosophy, which has proved to be their mantra for achieving accolades from all around the globe. Both common man and corporate management gurus wonder, as to how a semi-literate force of 5000 men operate in a team by delivering 200,000 tiffins on a daily basis, just by following a simple business model started by a visionary named Mr. Mahadev Havaji Bachche since 1890. It so happened that a Parsi banker was particular of having home-cooked food at lunch time, so he informally hired someone to serve his need. The joy of eating home cooked food resonated with many more people and thus the dabbawala system was informally born! Over the years they have improvised their system and their modern day operational efficiency has earned their organization Six Sigma Forbes ratings of 99.9%, which means there would be just 1 error in six million transactions of the dabbas! 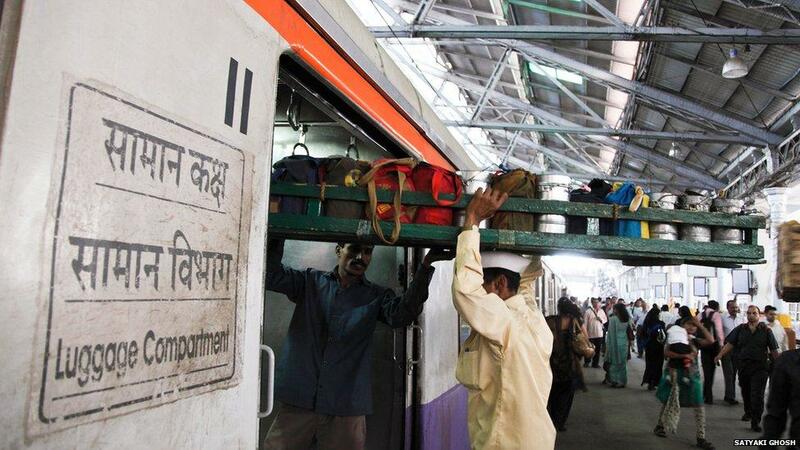 Tiffin crates being loaded in luggage compartments of Mumbai trains. Photo courtesy: Satyaki Ghosh. Impressed by their work standards, Prince Charles visited them during his India visit in 2003. The Prince later invited representatives of the dabbawala association for his wedding in 2005. The British business magnate and investor, Richard Branson too visited the dabbawalas in 2012 and was humbled by their simplicity and work ethics. Dabbawalas about to sort the tiffins as per their unique coding system. Photo courtesy: Google images. Monthly cost of hiring the dabbawala service is Rs. 450 only ( approx. 5 GBP /8$) and the average income of a dabbawala is around Rs. 8000 only ( approx. 82 GBP/ 138 $). Every dabbawala is an equal share holder in the organization and he knows that his poor individual performance will adversely influence their collective business profit, thus negatively affecting his personal income. Therefore they are on their toes to maximize organisational profits. Besides this, the emotional value that they add to their customer’s lives is beyond words. The feeling that someone at home cares for you and is taking efforts to send you a fresh home-cooked meal nurtures an emotional bonding between the sender and the receiver of the tiffin, and the dabbawala indirectly acts as a bridge between them. Their collaboration with tiffin services have also added value in lives of people who do not have anyone at home to cook healthy food for them. 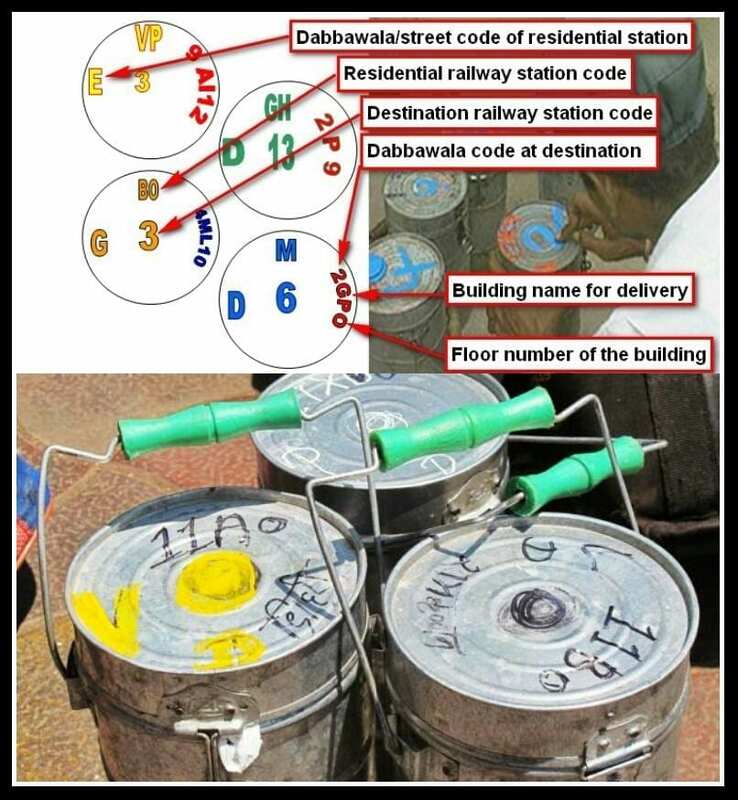 The Dabbawala coding system explained. Photo edited by Aditya Chichkar. The dabbawalas do not earn a 5 figure salary, but at the end of the day, the job satisfaction they achieve is of infinite value to them. They may be less educated but they certainly are spiritually upgraded, which is clear from the fact that the dabbawala association has recently initiated a ‘Share My Dabba’ program. More about it in this video link: https://www.youtube.com/watch?v=EZC1czZofyY. Patrons who agree to share the leftovers from their tiffin with street children, mark their ‘dabba’ with a small sticker. Before the tiffins embark on their return journey, volunteers distribute the leftovers to the street children and other less fortunate citizens of Mumbai. The best take away lesson from this gesture of the dabbawalas, is that social responsibility has to be deeply rooted into one’s character and cannot be learnt in any business school. Also one learns, that it is not about how much you receive that makes you empowered, rather it depends on how much you give and empower others that defines the quality & fulfilment of one’s life. Work is Worship-The Warkaris and Vithoba, the deity worshipped by the Dabbawalas. Photo edited by Aditya Chichkar. Prince Charles & Richard Branson sharing time and space with the Dabbawalas. Photo edited by Aditya Chichkar. 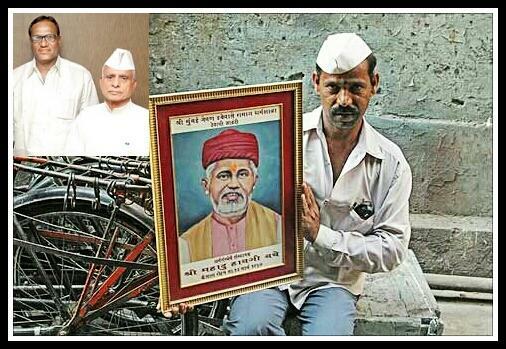 A Dabbawala holding the photograph of Mr. Mahadev Havaji Bachche, the founding father of the dabbawala tiffin supply system. Top corner: President & General Secretary of Nutan Mumbai Tiffin Box Suppliers Charity Trust , Mr. Raghunath Medge (left) & Mr. Gangaram Talekar. Photo edited by Aditya Chichkar. Love & Care is the prime ingredient in the home-made food, which the Dabbawalas carry. Photo edited by Aditya Chichkar. Top management graduates learning business management from the Dabbawalas. Photo courtesy: ‘The Hindu’ online newspaper. Mission Accomplished! 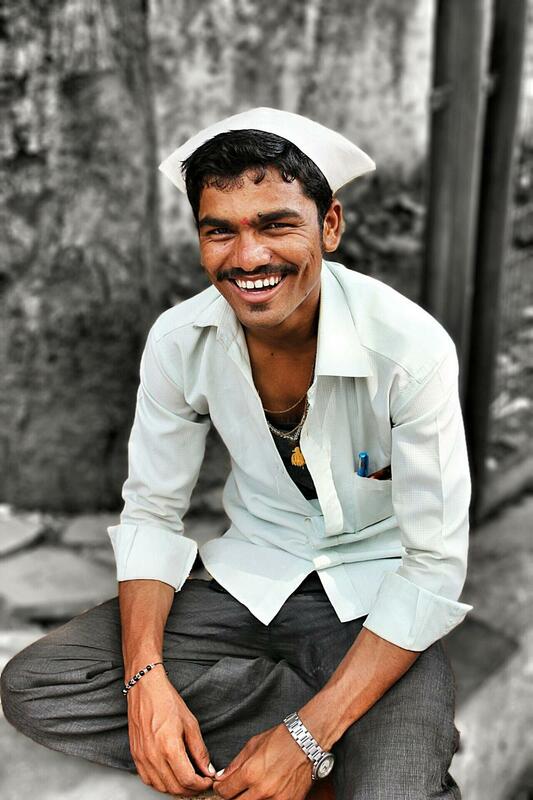 Job satisfaction radiates from every Dabbawala’s smile. Photo courtesy: Aditya Chichkar. Amazing! And our computer-run world is so regularly full of mistakes that we’re not surprised when they happen! Very well written, you have a total grip on the facts & the language… Cheers waiting for more to come…. What a fantastic idea and so well carried out, it is simply incredible. I never knew anything about this and the beautiful people that run it. It humbles one.